Probably few would think that I didn't have enough camera cases (touching on CCCHD), but still, a new backpack being delivered makes any day feel like Christmas day. While I have favorite photo subjects, I stay very generalized in my pursuits, enabling me to evaluate gear in the way it was designed to be used and allowing me to relate to those pursuing a wide range of subjects. Because I carry a variety of kit sizes, ranging from a single camera and lens up to multiple cases of gear requiring a Multicart, to locations ranging from my front yard to sporting events and from commercial shoots to the remote wilderness, I utilize a wide variety of packs. I don't get time to create reviews for all of them, but minimally attempt to highlight some of the best coming through. When I saw the MindShift Gear BackLight 26L Daypack announcement, I knew that a hole in my case solutions had just been plugged. MindShift Gear wasted no time in getting me a BackLight 26L evaluation sample and this pack has jumped right onto my favorite list. I will explain why, but first, let's take a tour of this backpack/daypack. Perhaps the first thing you noticed is that my backpack is green (my first in this color). This stylish outdoor-appropriate color is called "Greenfield" and those wishing for a less-bold option can alternatively select "Charcoal" (see picture near the end of this review). Perhaps the next color that draws your eye is the bright yellow found on the very large, glove-ready zipper pulls (attached to very substantial and easy-to-use zippers). The other bright yellow pull is used to separate the hook-and-loop fastener holding the tripod attachment strap in its pocket. The 8.5" zipper above this pocket provides storage for relatively flat items up to 3.5" (to 4" if flexible) in depth. Also included on the top of the case is a minimalistic but very strong handle. This handle has no padding, but the space a padded handle often requires is not consumed. Front and center on the back of the pack are the moderately padded, contoured shoulder straps. These straps are of course adjustable and the sternum strap is also adjustable, for both length and height. 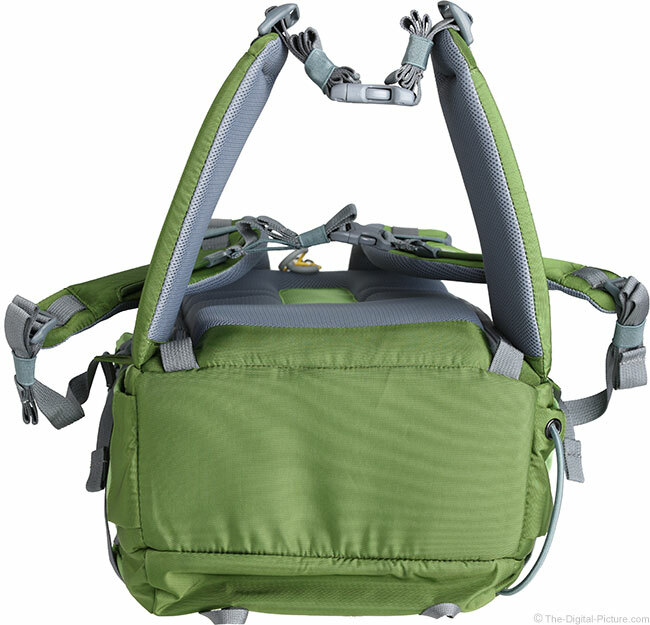 Strong attachment points are available on the shoulder straps as are two short elastic straps. Better seen in the next image is that the back of the pack is significantly padded with provisions for airflow to prevent overheating. The large double-pull zipper covering three sides of the back provides access to the camera gear section of the case. I'll discuss this in more depth later in the review. The padded waist belt with a wide web and modern buckle is the other obvious part of the back of the case. Suffice to say that there is plenty of length adjustability in the belt. With a narrow waist, I'm often dealing with the extra strap and trying to keep it in the elastic keeper bands. On the left side of this case is a large elastic pocket with an adjustable elastic strap at the top. I currently have my BackLight 26L's rain cover (included) stowed in this pocket. 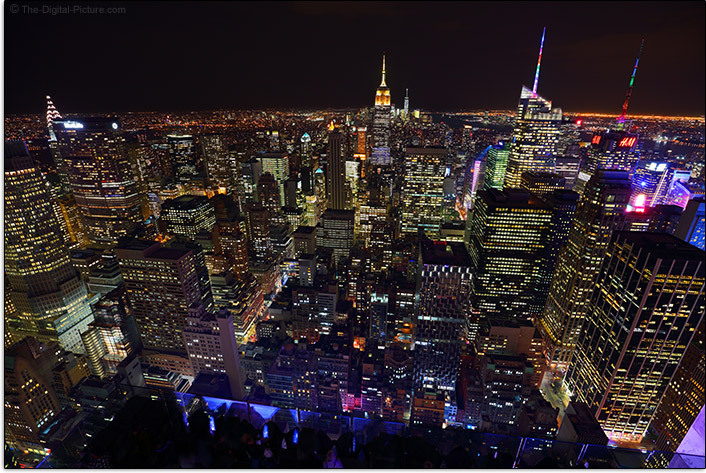 It is also ideal for a water bottle and many other items including a tripod. A pair of compression straps are provided to keep the overall backpack size minimized or to lash in a tripod, coats and other gear. A medium-large diameter, knot-adjustable (not designed for fast length adjustment) elastic cord is found on the bottom of this side of the case. You could lash a coat or similar into this cord. Aside from the bottom elastic cord being absent, the right side of the case mirrors the provisions of the left side. Thoroughly describing the bottom of the case creates a very brief discussion. Basically, there are a pair of small attachment loops on the back and a pair of large loops on the front. The front of the case includes a considerable number of attachment points in a variety of types including a pair of adjustable elastic loops near the top. Twin zipper pulls open up the front of the pack, though this lid does not open completely and expanding sides of the pack prevent the contents from spilling out. Leave the top/side compression straps attached to access only the top of this section or release the straps to most-fully open the front section. What you store in this section is totally up to you. Carrying personal gear such as clothes and food is a very logical use. I've also carried a significant amount of camera grip that did not fit nicely in the camera gear section of the pack. 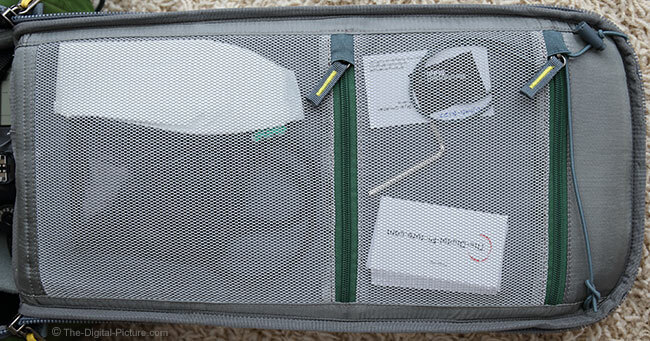 As seen in the above product image, a padded storage pocket is provided for a laptop (my Dell XPS 15 fits) and a separate less-padded pocket holds a tablet, papers or anything similarly thin. Additional small pockets are provided to hold pens and cards (business, credit, national park, etc.). Below the main zippers on the front of the case is another zippered pocket, measuring about 8.5" wide by 10" deep. MindShift Gear claims that there is 9L of total storage space in these various front pockets. How that space is configured for use is up to you. For example, if you pack a laptop, a tablet and something thick in the smaller front pocket, you will have less space for clothes than if those items were removed. 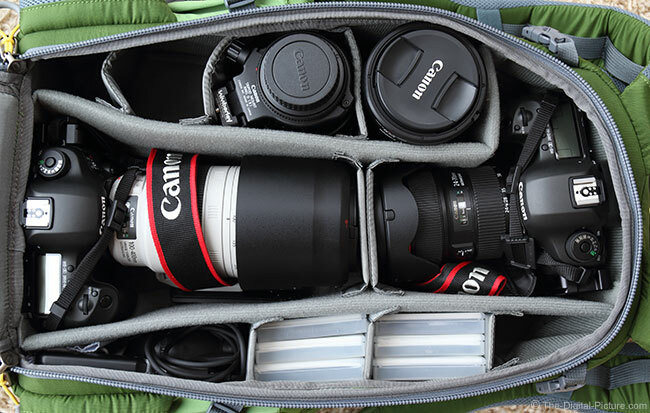 Especially nice is that this case readily adapts to how you want to use it, including compressing down to just large enough to hold your primary camera gear. I suggest that you lay out your gear on a table and see if it fits within the available size. 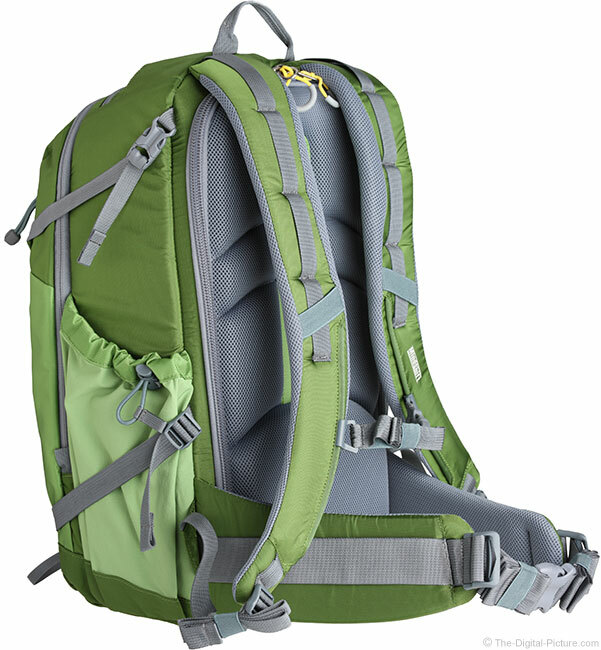 This backpack has a somewhat thin for the height profile that is good when maneuvering in tight places. These dimensions keep the BackLight 26L well within the current USA airline carryon baggage limitations and, it has fit in the overhead compartments in a pair of regional jets I've flown in. Though I have significantly changed my max elevation stat for this pack post review, the Top of the Rock is the max height my BackLight had seen had seen as of review date. I can't say that I ever wished a backpack that I was using was heavier. The weight of this backpack, considering the size and capacity, is very low and that is always appreciated. While the dimensions are great for determining what fits in a case, seeing gear in the case is often easier to visualize. I'll start with the gear configuration similar to what I am currently most interested in carrying. 6 Filters, a Rocket Blower, a timer remote and plenty of room remaining for batteries, another lens or two and more. That is enough gear to cover a higher percentage of outings. Note that the Canon EF 70-200mm f/2.8L IS II USM Lens can be swapped for the 100-400mm lens in the above configuration. I remove one of the double padded dividers shown between the mounted lenses for this option (the 70-200 is slightly longer). Note that the cameras shown are without battery grips. Installed grips and pro bodies will not fit in the normal orientation. Also note that this pair of cameras with lenses mounted, along with the double divider between them, consumes the full length of this space (the fit is snug). While most of the included dividers are shown in this configuration, missing in my opinion is a second long divider with the 90° bend capability to make a second DSLR and mounted lens fit more easily into the case. A bit of non-standard divider arrangement accomplishes the goal, but ... better would have been to provide an optionally used hinge on the second long divider just as the first has. I have subsequently put a hard bend in the long straight divider, making it shaped similar to the other naturally bent one. This results in slightly more space becoming available, including room for another lens in the bottom corner. The lid has a pair of large semi-transparent pockets ready to hold thin items such as filter wrenches, garbage bags, memory cards, microfiber cloths and other similar items. Also seen mostly tucked into a pocket in this photo is a small neck strap that is designed to hold the lid open when the pack is being accessed while attached by the waist strap. Why the MindShift Gear BackLight 26L? I talked about a hole in my case solutions being filled. When you are out and about for more than a couple of hours, and especially when hiking, it is very likely that you are going to need more than camera equipment with you. The temperature (or your temperature) is likely to change throughout that period of time (meaning that layers of clothing need to be transported) and at least some amount food and water is likely going to be needed prior to returning. 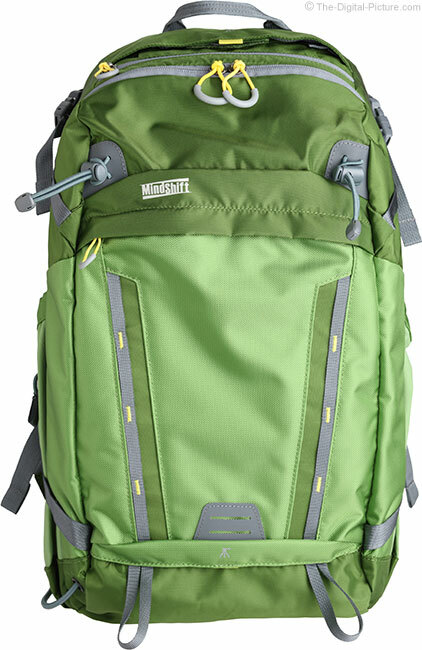 Another backpack I love that has these provisions is the MindShift Gear Rotation 180 Professional. This backpack is a great choice for these days, but taking a second DSLR and/or more than a few lenses will quickly consume much of the otherwise spacious allocation for personal gear. One more difference is that the 180 Pro dimensions specs are just over the current US airline carryon limits, though you may be able to get this one through. That is where the BackLight 26L comes in. This backpack lets you take a significant amount of camera gear (fully loaded, you will likely get tired carrying it) while still having room for the personal gear. While not completely unique, a feature that I especially like about this pack is the rear access to the camera gear and I like this for a couple of reasons. 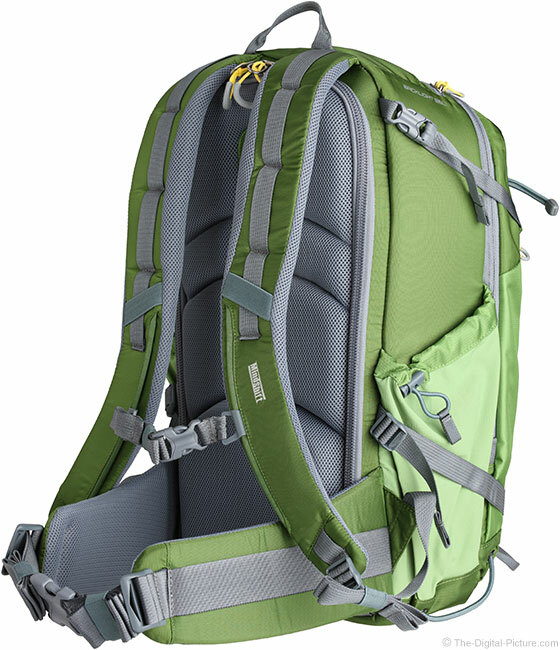 First, the back of the backpack and the shoulder straps can stay clean when putting the backpack on the ground for camera gear access, which in turn keeps your clothes clean. 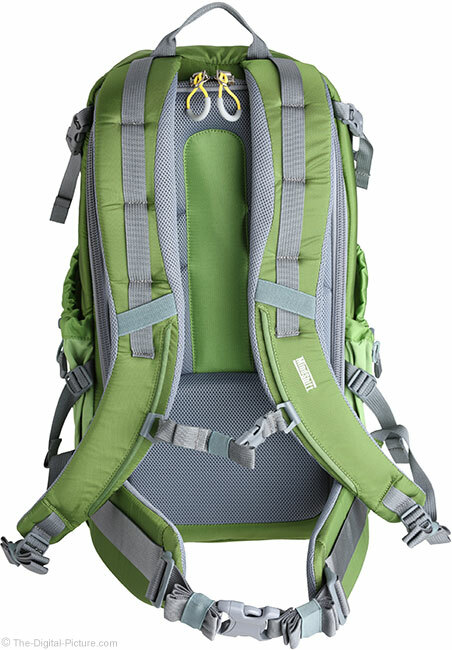 Another benefit is that one's arms can be removed from the shoulder straps and the backpack can be rotated on the waist belt for fast gear access without fully removing the pack and without putting the pack on the potentially wet/muddy/unstable/etc. ground. This of course also aids in keeping your clothes and pack clean. When the primary backpack lid used to access the camera gear is also used for storing other items including lunch, jackets, a tripod, etc., opening that weighted/bulky lid can become awkward and can even cause the resting pack to become unstable if the terrain is not flat. In this case, opening the the gear lid is unlikely to destabilize the pack. The way the load is positioned in this case is another big advantage it has. This pack will allow you to take your laptop or tablet along, but there is basically no penalty (one thin padded divider) in terms of overall pack size to have this feature included if you don't take the device or if you take it out, such as upon reaching your destination. 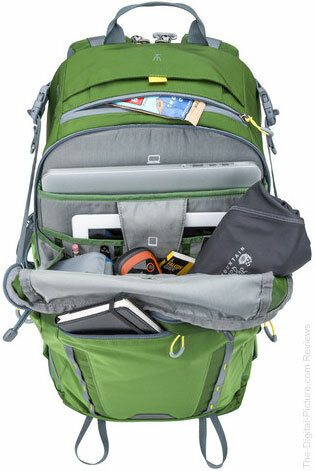 Often, a backpack's laptop storage section is against your back, causing the heavier weight of your cameras and lenses to shift rearward, away from your back, a disadvantage especially when not carrying the device. Moving the weight balance of your pack rearward pulls back on your shoulders and pushes forward on your hips and this will become uncomfortable over time. You want the weight balanced as closely to your body as possible, ideally pressing straight down on the hip belt. Cameras and lenses are generally the densest items you are carrying and having them close to your back is good ergonomics. With the personal gear (or whatever you want to carry) being positioned behind the camera gear, the back can expand or compress as needed at any time. Take all personal items out and the pack can be nicely compressed. 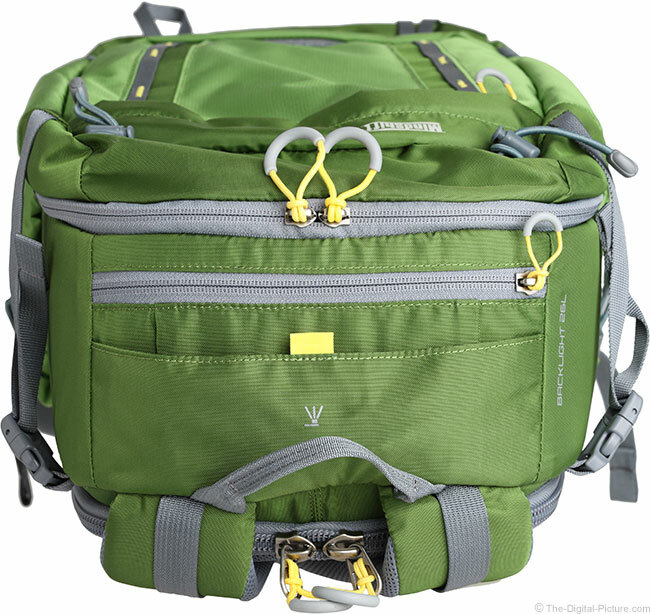 With no compression strap crossing over the camera gear storage section's zippers, accessing the gear is faster and the BackLight 26L design allows for this. Camera cases are a big part of my life and good ones definitely make my life better. With the thoughtfully designed, high quality BackLight 26L in my kit, life got better. 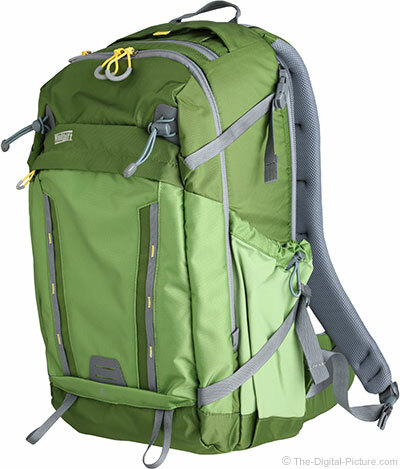 Since this review was originally written, I have had this pack on many trips and many hikes (some reaching 8+ miles). The pack simply works great and does not grow uncomfortable over time.